Beyond an extensive selection of instructional and repertoire books for guitar, mandolin, banjo, tin whistle, ukulele, fiddle and harp, we often have featured books from specialty publishers. Here’s a sampling. This is a must-have book for anyone interested in American old-time music. 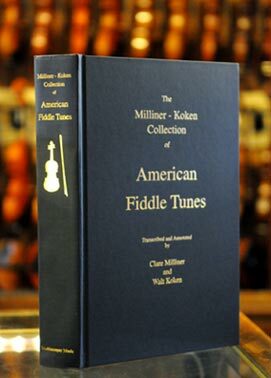 Over 1400 American old-time fiddle tunes, 888 pages, representing 347 fiddlers, most born before 1900. The book includes biographical information, tune cross-referencing and more. This monumental project was led by Walt Koken. Walt has a long involvement in string band music, having been a member of the Highwoods String Band. The book is $90, which sounds like a small chunk of change until you consider just how incredibly well done it is. Just think of it as less than 7 cents per tune. For fans of New England fiddle styles, these books are stellar collections of tunes. If you play for dances, they’re indispensable. The Waltz Book is now up to four! volumes of new and traditional waltzes. The Portland Collection, Volume 1 and 2, and now the brand new Volume 3 are in stock. More tunes than you can shake a bow at. We also carry a knowledgeable selection of acoustic music recordings as well as instructional DVDs.